Fordell Firs Blog: All Quiet! This was an unusually quiet weekend sandwiched between 2 very busy weeks - the previous week's visitors leaving on the friday/saturday and the new ones not scheduled to arrive till the monday. However, this gave the centre staff a good opportunity to catch up with a number of projects and carry out some general maintenance work on the site. Above : Action photo taken during 2007 Scout Hide and Seek Championships. 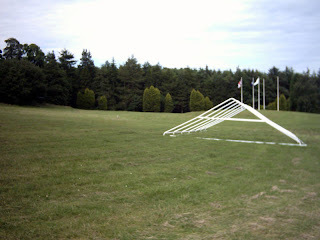 Staff are still trying to locate the person who left their giant coathangers behind on the main field after the event. Saturday saw a small number of activities running (for a birthday party group) which gave some of the staff the chance to team up with others and learn a bit more about activities which they don't currently run themselves (but are training towards). The abseiling in particular was very popular and featured a high and safe staff/child ratio due to the combination of lots of spare staff and a small group! Assessment of all the roped activities is carried out regularly by an external examiner, but during training staff are encouraged to team up with qualified centre instructors and help with certain tasks under supervision in order to gain experience. Aside from the few activities, the Fellowship members managed to finish off installing a new kitchen in 'Dingly Dell', the beloved static caravan next to the activity store which is used for a number of purposes including housing visiting staff members and small groups (the most recent being a German group who were visiting a few weeks ago). The work had been started by staff during the week and after completion was deemed to be a big improvement. Sunday was even quieter than Saturday as the last remaining group on site (a youth club from London) had departed at midnight for a looooooong drive down south. Another birthday party visited the centre for a morning of grass sledging, go-karts and caving, but the main task of the day was to sort out a huge amount of equipment which was required for a large Boys/Girls' Brigade camp next weekend. The centre/Scottish Headquarters has a wide range of equipment which can be rented out by visitors, including tents, marquees and cooking equipment. Although much of this is currently down south in preparation for the World Jamboree, after a lengthy search the staff managed to track down 20 patrol tents and a myriad of cooking equipment which will be used for the camp. All in all a very productive weekend, but likely to be one of the few very quiet ones until well after the summer.